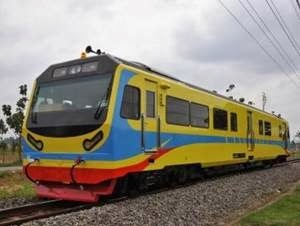 PT Industri Kereta Api (Persero) - PT INKA (Persero) or referred to as "INKA" is a rapid growing state-owned company in Indonesia, based in Madiun East Java and running business in the field of intregrated railways and urban transportation. INKA has core busines competencies in the production of passenger and freight trains, trains parts as well as maintenance and repair services. INKA is widelyknown nationwide as the pioneer in integrated rolling stock and automotive industry in the South East Asia region. The Company was established in 1981 as a transformation results of Balai Yasa Lokomotif Uap of PJKA (now PT Kereta Api Indonesia or KAI Group). INKA now has 2 key subsidiary companies, namely PT Rekaindo Global Jasa and PT Railindo Global Karya. INKA's head office is registered at Jl Yos Sudarso No 71 Madiun. In 2014, the performance of INKA is showing good results. PT Industri Kereta Api (Persero) reported total revenue of Rp 1,066.5 billion in 2014. This total revenue figures equivalent with 109.65% growth from Rp 508.7 billion in 2013. The Company's total current year profit in 2014 amounted to Rp 13.7 billion as compared with loss Rp 96.8 billion in 2013. This figures was quoted by JobsCDC.com from the Indonesian State-Owned Companies profile issued by the Ministry of State-Owned Enterprises of Republic Indonesia (Kementerian BUMN). D3/S1 Mechanical Engineering, Electrical Engineering, Welding Engineering. Possess certification in welding engineer. D3/S1 Mechanical Engineering, Electrical Engineering, Industrial Engineering, Welding Engineering, Civil Engineering. Mastering Auto Cad and able to read shop drawing. Strong understanding about the process and procedures of export and import. D3/S1 Informatics Engineering, Graphic Design. Mastering graphic design software: Auto Cad, Adobe Photoshop, Adobe Illustrator and Corel Draw. Strong understanding about Occupational Health and Safety Management System (SMK3). Possess expertise certification K3 Umum. D3/S1 Mechanical Engineering, Industrial Engineering, Management. Strong knowledge and good understanding about purchasing, inventory and procurement procedures. D3/S1 Mechanical Engineering, Electrical Engineering, Civil Engineering. Strong understanding about production control and process. D3/S1 Mechanical Engineering, Welding Engineering, Civil Engineering. Mastering Windows Server and Networking. Expertise with installation and troubleshooting of computer and other hardware and software. Mastering programming language and IT product development. Strong knowledge and good understanding of corporate law and business law. Able to prepare and analyze financial statements. D3/S1 Mechanical Engineering, Informatics Engineering. Strong understanding and able to create inspection sheet. D3/S1 Mechanical Engineering, Electrical Engineering, Industrial Engineering, Management. Able to estimate the price and marketing concept. D3/S1 Industrial Engineering, Mechanical Engineering, Human Resource Management, Administration. Maximum age of 30 years old (Junior Staf) and 35 years old (Senior Staf) on 1 April 2017. Minimum 3 years of experience (Junior Staf) and 6 years of experience (Senior Staf). JobsCDC.com now available on android device. Download now on Google Play here. Please be aware of recruitment fraud. The entire stage of this selection process is free of charge. PT Industri Kereta Api (Persero) - D3, S1 Junior Staff, Senior Staff INKA March 2017 will never ask for fees or upfront payments for any purposes during the recruitment process such as transportation and accommodation.